M.R. 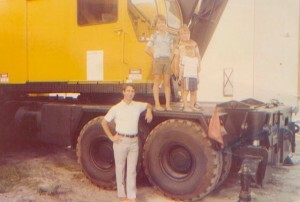 Harrison Crane Service was founded in 1947 by Maurice R. Harrison. M.R. Harrison Construction had been in business since 1926 and the crane company was originally founded in large part to satisfy the construction company’s growing demand for cranes. Over the next several decades, M.R. Harrison Crane Service grew substantially to become one of the preeminent crane rental companies in the southern part of the state. While the company did continue to service the construction company, it also built a broad and varied list of customers—serving every type of company from precast concrete erectors to handling all of the stevedoring work at the Port of Miami. In the mid to late 80’s the construction company fell upon hard times from which it would ultimately never recover. In an attempt to keep the construction company afloat, many of the cranes in the 36 crane fleet were sold off including two 200 ton Link-Belts and many other large conventional cranes. Mike Harrison, Sr., who was the grandson of M.R. Harrison and who had worked at M.R. Harrison Crane Service since 1970, saw the writing on the wall at this point as he watched the fleet he had managed and grown be decimated; rather than let this continue, in 1989 he bought what was left of the company and changed the name to Harrison Crane Service. Under Mike Sr’s stewardship the company navigated these tough times and through it all managed to remain one of South Florida’s best and most respected rental houses. Since the mid 90’s the company has gradually built its fleet back up. Mike Sr. is no longer at the helm and has passed control of the day to day operations of this 4th generation business, to his three sons–Mike Jr, Paul, and David. The Harrison’s are proud of their 60 plus year legacy in the crane rental business, but rather than looking at the past, they are more excited about looking to the future and continuing to build South Florida’s future—one job at a time.